A new rumor propagating via twitter, social networks and other attributes of modern civilization says that the old rumor was just a rumor. 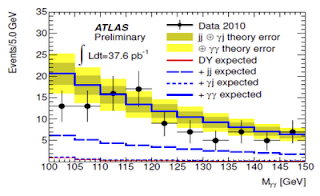 The ATLAS collaboration was working hard this last week to investigate the possible signal of Higgs decaying to photons. Observations of such a signal was claimed in an internal memo written by 4 of its members. However, after analyzing about 100 pb-1 of currently available data ATLAS concluded that the suspicious excess in the γγ invariant mass distribution is going away. C'est la vie, as the local folks would say. A parallel rumor says that CMS sees nothing unusual in the γγ channel. That would pretty much end the career of the first LHC rumor. Maybe it's for the better. Otherwise the Higgs boson would have to be renamed to the Wu boson which could lead to some confusion. Update: ATLAS officially quashes the rumor. 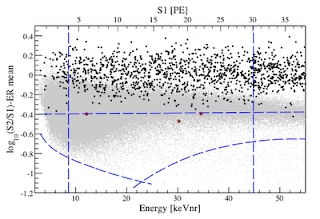 With 131 pb-1 of data there is no peak in the γγ invariant mass spectrum near 115 GeV. 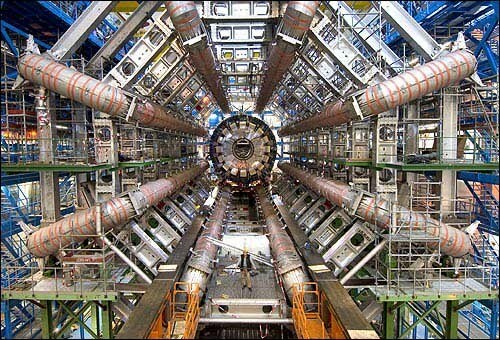 So, the note claims no less than a firm evidence for a 115 GeV Higgs boson decaying into 2 photons. 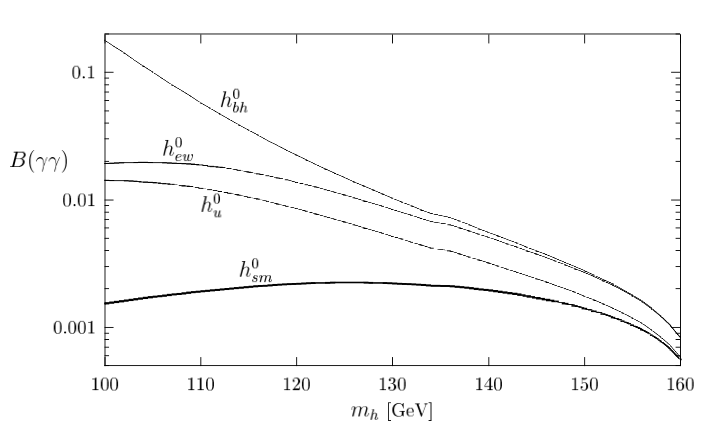 This decay occurs in the standard model with the amplitude dominated by a W-boson loop. However, this decay is very rare - only about 0.2 percent of Higgses decay this way. 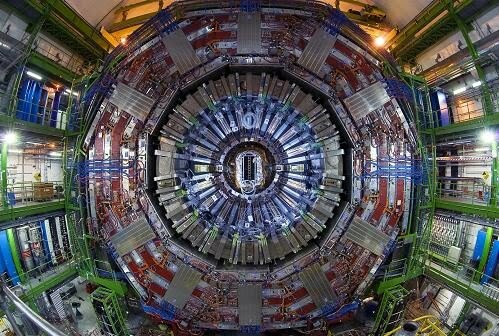 It's absolutely impossible that ATLAS is seeing the standard model Higgs - the rate is way too small. However, one can imagine theories beyond the standard model where the production cross section of the Higgs and/or its branching fraction into 2 photons is enhanced. Enhancement of the H to γγ rate by 20-30 times sounds humongous. This is certainly not a feature in any mainstream model, and I'm not aware of a single theory paper that predicts it. A recent paper argues that in the MSSM the rate is usually suppressed; in the NMSSM an enhancement is possible, however by a factor of 2 rather than 20. One ancient paper studies this issue in a more general manner. 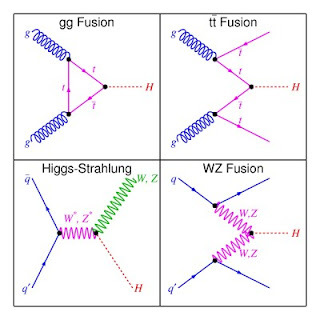 Large enhancement of the branching fraction to 2 photons is possible if the Higgs couples only to up-type quark (h0_u), or if it does not couple to fermions at all, the so-called fermiophobic Higgs (h0_bh). But this is still not enough; one would need in addition new charged particles with a large coupling to the Higgs (4th generation?, composite fermions?) in order to pump up the production rate. Strictly speaking, ATLAS observes a particle decaying to 2 photons, likely a scalar, and likely produced in gluon fusion. A coupling to photons or gluons is not a defining property of the Higgs boson. 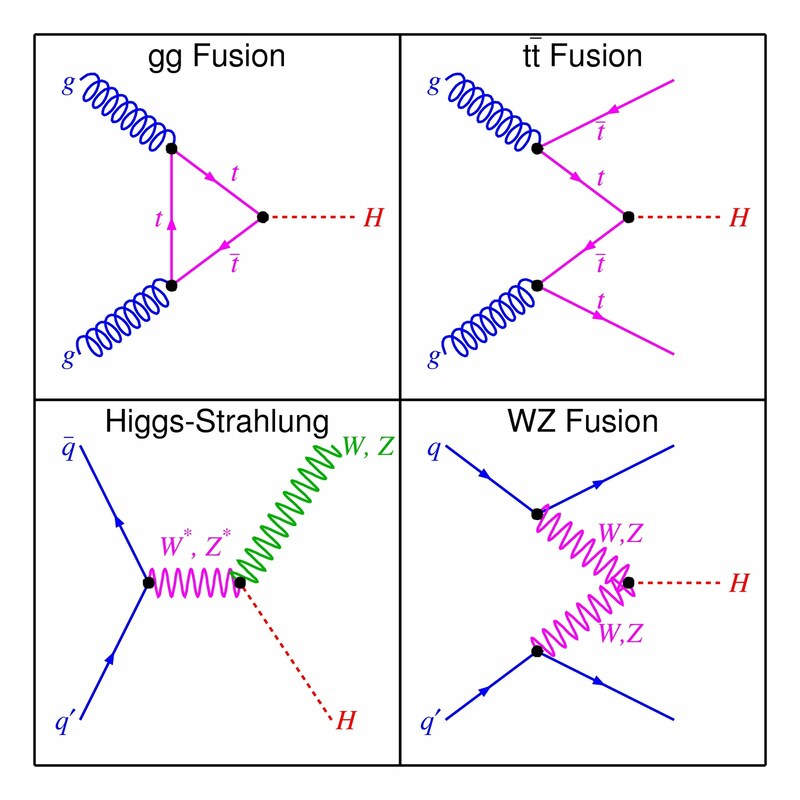 To demonstrate the Higgsesness of the new particle one would have to pinpoint its coupling to electroweak gauge bosons, for example by measuring its associated production with W and Z bosons. Until that is done, alternative options are on the table. Whatever it is, it means busy days ahead, for theorists and experimentalists alike. One thing is certain: it's not a hoax, the note and the analysis really exist. But one should keep in mind that the result has not been internally reviewed yet, thus, at this point, it is not backed by the entire ATLAS collaboration. It may well turn out to be a false alarm... or it could be the discovery of the century... stay tuned. 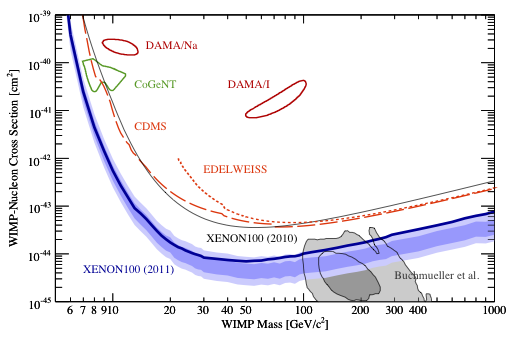 For a 100 GeV dark matter particle the limit is around 10^-44 cm2, 3 times better than the previous limits from CDMS and Edelweiss. For light dark matter the improvement seems to be even better, more than an order of magnitude, which further disfavors dark matter interpretations of the CoGeNT and DAMA signals. Actually, the paper mentions in passing that the analysis leading to these limits was not completely blind. After opening the box, there were many events at small recoil energy of which 3 fell into the signal region, which would make 6 signal events in total. However after investigating these 3 additional events the collaboration decided they were static from the electric can opener ;-), and devised additional cuts to get rid of them. So what do these results tell us about the WIMP dark matter? At which point should we start to worry that we're on the wrong track? 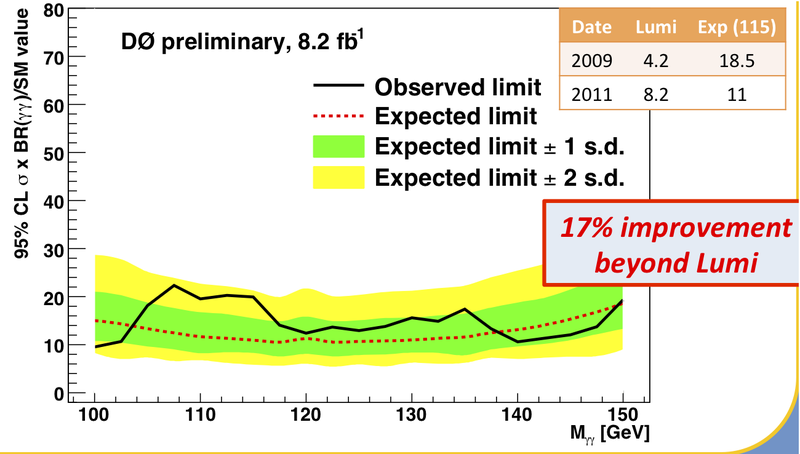 Unfortunately, there is no sharp prediction for the dark matter cross section. 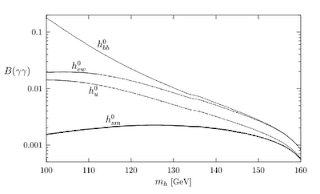 The most appealing possibility – a weak scale dark matter particle interacting with matter via Z-boson exchange - leads to the cross section of order 10^-39 cm2 which was excluded back in the 80s by the first round of dark matter experiments. There exists another natural possibility for WIMP dark matter: a particle interacting via Higgs boson exchange. This would lead to the cross section in the 10^-42-10^-46 cm2 ballpark (depending on the Higgs mass and on the coupling of dark matter to the Higgs). This generic possibility is now getting disfavored thanks to Xenon100's efforts, unless the Higgs is heavier than we expect. Therefore, even though models predicting the cross section below 10^-44 cm2 certainly do exist, it may be a good moment to start thinking more seriously about alternatives to WIMP. In the worst case dark matter may be very weakly interacting (axions, gravitinos) or very light (keV-MeV scale dark matter), in which case the current approach to direct detection is doomed from the start. See also Peter's and Tommaso's blogs. Gosh, I was damn busy all day, and by now all major blogs have already run the story. 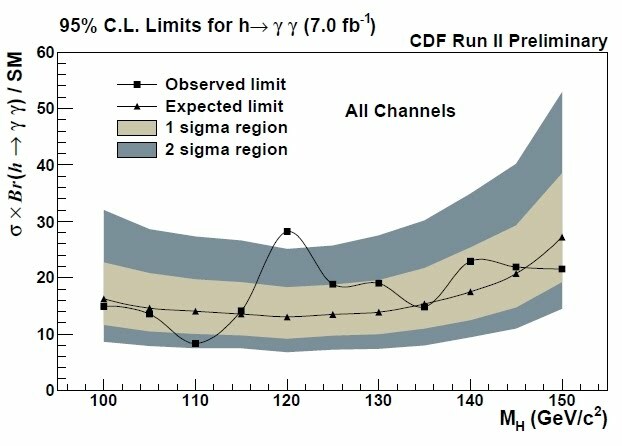 Anyway, better late than never... CDF claims a 3 sigma excess in the dijet invariant mass distribution in the lepton + neutrino + 2 jets events. This analysis was originally devised to search for the diboson WW and WZ final states, where a W boson decays leptonically and the other electroweak boson decays into 2 jets. 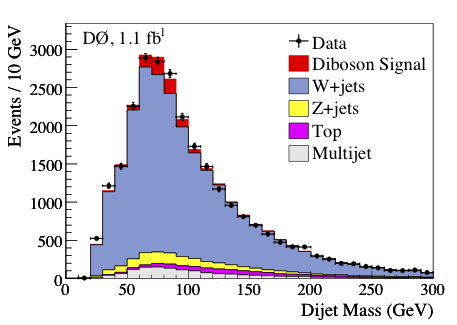 The latter should show up as a broad peak in the dijet invariant mass spectrum, on top of a much larger background from the generic W+jets production. 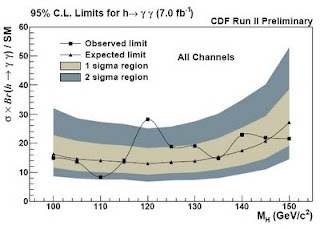 Indeed, both D0 and CDF could see the peak below 100 GeV, which allowed them to pinpoint the diboson production at the 5 sigma level and measure the diboson production cross section. 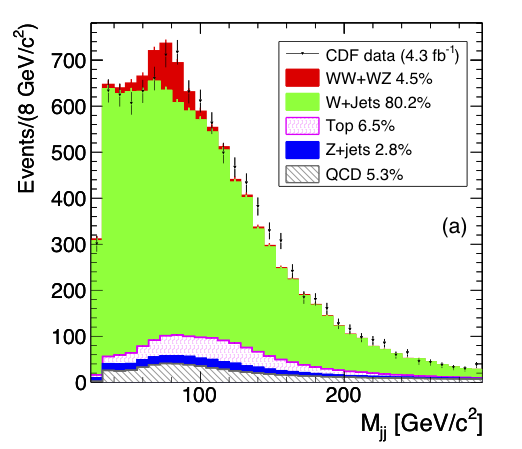 However, CDF had also a small blip around 150 GeV which was not expected. All in all, the excess advertised in today's CDF paper is not exactly new, and it has been widely discussed among theorists. Moreover, the analysis published today has been publicly available for some time in the form a PhD thesis. What changed with respect to the earlier CDF diboson search is that the cuts have been slightly revamped to make the bump more pronounced. 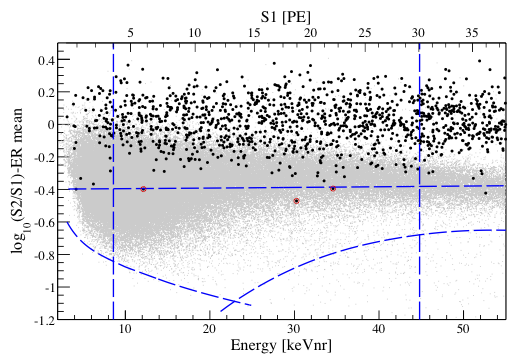 The excess over the standard model prediction is estimated to be slightly above 3 sigma. In spite of these caveats the effect is definitely interesting and we cannot exclude it is real. What could it be? It is not a Higgs; anything Higgsish with 150 GeV mass would prefer decaying to a pair of W bosons or b-quarks rather than to 2 light jets. The simplest explanation, proposed in this April Fools' paper, involves a 150 GeV Z' boson. A light Zprime with a significant coupling to leptons is excluded by LEP and the Tevatron, but if the coupling to leptons is small then the limits are surprisingly weak. In particular, 150 GeV Z' with electroweak size couplings to quarks is perfectly allowed, and would have the right cross section to produce a bump observed by CDF. One should note that Z' with the mass of that order could generate a large forward backward asymmetry of the top production, as observed in another CDF analysis. 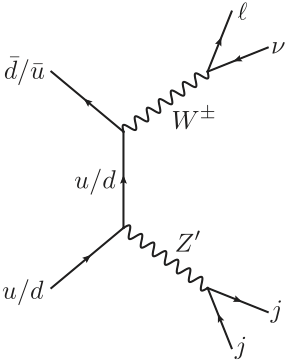 But one should also note that generating the asymmetry requires a large flavor violating coupling u t Z' which in principle is not related to the coupling to the light quarks that is probed by today's CDF paper. In a month or so, when I post an update, there will surely by dozens of new models explaining the bump, and some of them may link to the top asymmetry in a more direct way. For more comments see Flip, Tommaso, Sean, and Michael, Peter, Lubos, and again Tommaso. Even though the LHC is flooding us with new results, Tevatron's forward-backward asymmetry of the top-quark pair production remains the most intriguing collider result as of today. The effect hints at an exciting new physics at or below the TeV scale which may soon be uncovered by the LHC, or maybe by further analyses at the Tevatron. To visualize what kind of departure from the standard model we need to explain the Tevatron data, see the plot borrowed from this paper The plot shows a model independent fit to the Tevatron top results. 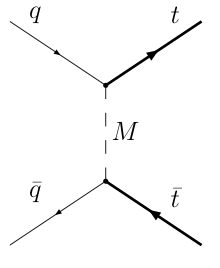 The axes are the forward and backward production cross sections of top pairs with the high invariant mass, m_ttbar > 450 GeV. One can see that the cross sections has to be modified by some 10-20 percent, and that the best fit point corresponds to the backward cross section being smaller than the standard model one. This is possible if new physics contribution to the top pair production interferes destructively with that of QCD. the new particle should not be too heavy and should couple strongly enough to both the 1st generation quarks and to the top quarks. Otherwise the effect would not show up on top of the QCD top pair production. the new particle should couple chirally, that is to say, with a different strength to left- and right-handed quarks. Otherwise it would not generate a forward-backward asymmetry. In the text below I dropped some links to a few interesting recent examples. In the s-channel models the asymmetry is due to a resonance which can be produced in a q-qbar collision and decays to a pair of top quarks. An example of such a resonance is a Kaluza-Klein excitation of the gluon in Randall-Sundrum-type models, or more generally an axigluon in models where the standard model SU(3) color group is extended. This class is somewhat disfavored by experiment. Since the differential top production cross section measured at the Tevatron agrees very well with the standard model, the resonance has to be either very heavy or very wide. Furthermore, since the resonance has to couple strongly to the 1st generation quarks, it is constrained by the negative results from the LHC resonance and contact interaction searches in the dijet final state. 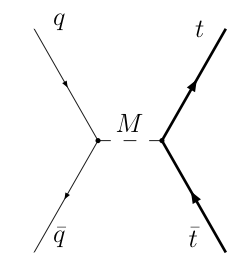 In the t-channel models the asymmetry is generated by an exchange of an off-shell particle that has a cubic vertex with one 1st generation and one top quark. There are many possibilities for the mediator: it could be a gauge boson or a scalar; electrically charged or neutral; a color triplet, sextet, sexist, octet, and so on. Some of these models survive all experimental constraints, although there is always some tension with the measured differential top production cross section. Another problem with this class is philosophical: the new particle has to have a large flavor violating coupling to the 1st and the 3rd generation, whereas similar couplings to the 1st and 2nd or to the 2nd and 3rd generations appear to be severely constrained by experiment. If any of these models corresponds to reality then some unexpected flavor structure is being revealed. 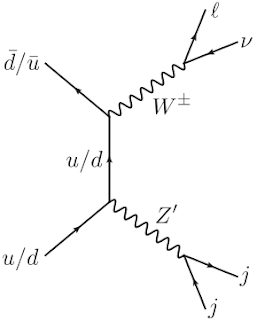 As for the last class mentioned above, I'm aware of only one model of that kind where a new co lor triplet scalar decays to a top quark plus a light invisible fermion. Sounds much like stop → top + neutralino, although the required couplings do not fit SUSY. 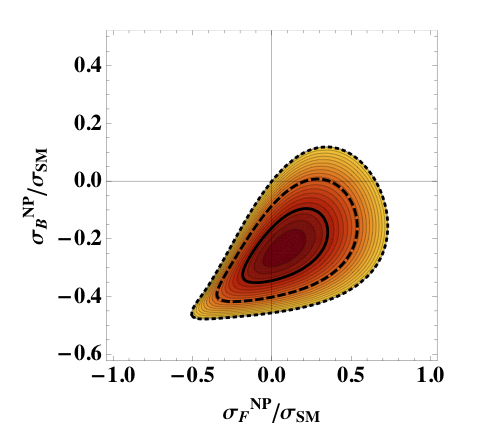 As the new particle production cannot of course interfere with the QCD top production, this possibility is somewhat disfavored by the top cross section measurements. On the other hand, such a new particle can be very well disguised, especially when its mass is close to the top mass, and is currently poorly constrained by new physics searches. So which model is true? 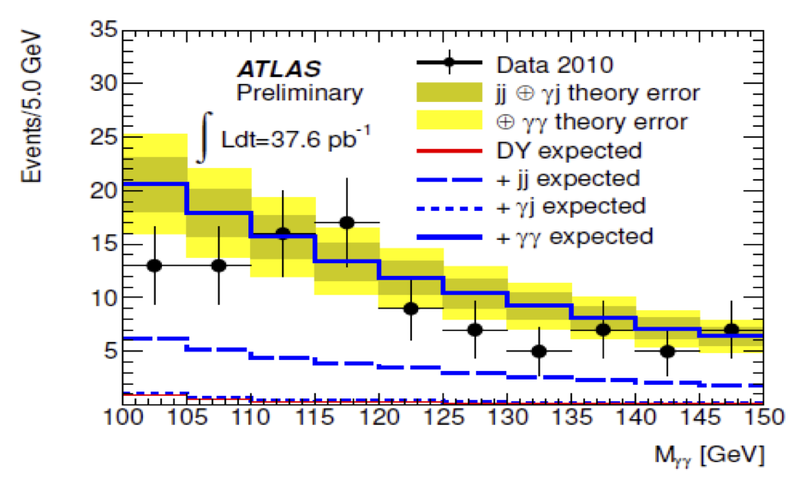 If we're lucky the answer may already be in the 2010 LHC data; however very few top analyses has gone public so far. Otherwise we'll have to wait till the summer conferences. If the LHC continues at this pace we may have 1 inverse femtobarn to play with by that time. April Fools'11: ATLAS or CMS? 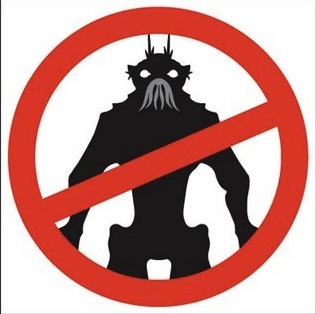 One of them must leave! "This was a very difficult decision to make. However, we are going through difficult times and radical steps could not be avoided. In the current budgetary situation we simply cannot afford running two experiments with identical physics goals and similar detection capabilities." Makes sense, at first glance. 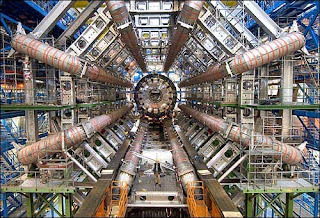 CERN is seriously indebted and some austerity measures need to be implemented. Nevertheless, laying off over three thousand researchers seems exorbitant at this point. Here at CERN it is not a secret that this decision was prompted by the growing animosity between the ATLAS and CMS collaborations which is seriously disrupting the LHC operation. The relations between these 2 experiments have always been strained but they further deteriorated last winter with the arrival of the results from the 2010 run. 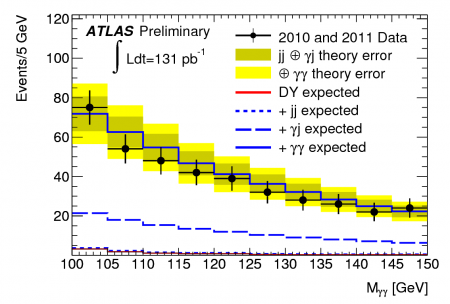 The spark that triggered the conflict was the fact that the constraints on supersymmetry from ATLAS were systematically more stringent than those from CMS. 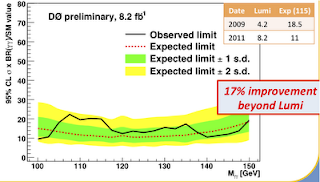 For laymen it may appear irrelevant whether a 800 GeV gluino is excluded at 95% or at 91% confidence level, but for particle physics experiments these numbers are of primary importance. Consequently, CMS accused ATLAS of using dirty statistical tricks to boost the significance of their result. From that point it all went downhill, and almost every day brought new incidents, such as leaking of hacked ATLAS emails, a bug found in the CMS control room, a libel lawsuit against the ATLAS spokesperson, etc. But the most serious incident happened 2 weeks ago during the Moriond'11 conference in a hotel resort in the Italian Alps. What started as a benign discussion about the missing energy resolution turned into a regular fist fight involving a dozen members of ATLAS and CMS; all that happening in front of terrified tourists and local villagers. Although nobody got seriously hurt, that incident was probably the last straw, and the CERN management decided to put an end to the conflict in the most drastic way. Now, what will happen to the thousands of researchers who often devoted their entire careers to the experiment? Hopefully, a number of them will be allowed to join LHCb or ALICE who will surely welcome additional manpower. Furthermore, CERN Director General promised that many of those laid off this year will be rehired in 2013 to help training the superconducting magnets, which will be the vital step in the preparations for the energy upgrade in 2014.